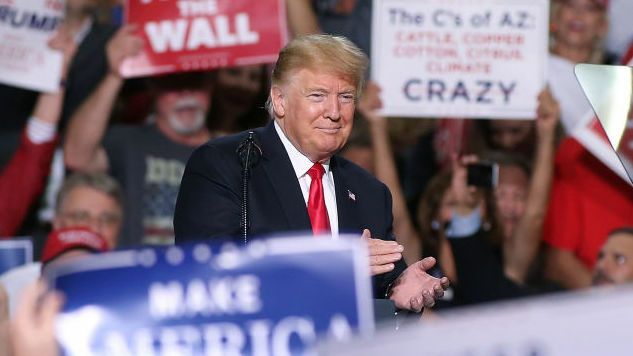 At Thursday night’s Trump rally in Missoula, Mont., the president endorsed Jon Tester, who’s served as Senator of Montana since 2006. Which is all good, except … Tester is a Democrat. The rally was meant to continue pushing for support of Tester’s opponent, Matt Rosendale, as well as Greg Gianforte. It’s also the same rally where Trump praised Gianforte for body-slamming a reporter. The Missoulian reports that Trump claimed his mission was to “punish” Tester for throwing a wrench into his plans to lead the Department of Veteran Affairs. According to his website, Tester: is an advocate for women’s rights, including abortion; believes in healthcare at an affordable rate for all; and has made a point to be totally transparent in his governance. He was the first senator to actually make his schedule public. Tester’s most recent accomplishment is a win for veterans, a group for whom he lobbies hard. His most recent bill makes it easier for veterans to access healthcare from a private doctor.